The purpose of this thread is to present the truth of Catholic teachings and correct any/all misinformation and errors about Catholic beliefs. There is a great deal of misrepresentation from sources that fail to provide accurate and intellectually honest information about them. One of the things I did find most interesting in Eusebius' "Church History" was his willingness to entertain the doubts expressed by other ancient writers as to the authenticity (at least as to authorship) of some of the books in the New Testament now considered canon. Posterity owes a lot to Eusebius for his monumental "Church History." From what I read, he apparently lived during the period of transition, when the old order was changing and all connected with it was passing into oblivion. He came forward at the critical moment with his immense stores of learning and preserved priceless treasures of Christian antiquity. This is the great merit of the Church History. Great as was Eusebius's learning, it had its limitations which could be said to flow from his position as the first court-appointed Christian theologian in the service of the Roman Empire. Much traditional scholarship has regarded him as one who risked his orthodoxy and perhaps his character because of his zeal for the Constantinian establishment. Orthodox Wiki states that notwithstanding the great influence of Eusebius' works on others, he was not himself a great historian. His treatment of heresy, for example, is inadequate. His historical works are really apologetics. In his Ecclesiastical History, Vol. 8, chapter 2, he points out, "We shall introduce into this history in general only those events which may be useful first to ourselves and afterwards to posterity." He was provokingly ill-informed about the Western Church. He knew very little about Tertullian or St. Cyprian, due, no doubt, to his scant knowledge of Latin. But in the case of a Greek writer, like Hippolytus, we can only suppose that his works somehow failed to make their way to the libraries of the East. Catholic Encyclopedia states that the notices in the Church History bearing on the NT Canon are so important that a word must be said about the rule followed by Eusebius in what he recorded and what he left unrecorded. Speaking generally, his principle seems to have been to quote testimonies for and against those books only whose claims to a place in the Canon had been disputed. In the case of undisputed books he gave any interesting information concerning their composition which he had come across in his reading. The subject was most carefully investigated by the well-respected Protestant historian, Lightfoot, in an article in "The Contemporary" (January, 1875, reprinted in "Essays on Supernatural Religion"), entitled "The Silence of Eusebius". In regard to the Gospel of St. John, Lightfoot concludes: "The silence of Eusebius respecting early witnesses to the Fourth Gospel is an evidence in its favor." It certainly did showing it is a cult not a true faith in Jesus Christ changing the Word of God into a lie. Teaching that only RC's inherit heaven. Teaching that Non Rc's do not have the fullness of the gospel by not being RC therefore are excluded from heaven. This doctrine can be found in the official RC catechism article 181 . The church described as the RC institution. quote" NO ONE CAN HAVE GOD THE FATHER WHO DOES NOT HAVE THE CHURCH AS MOTHER unquote. It certainly did showing it is a cult not a true faith in Jesus Christ changing the Word of God into a lie. Teaching that only RC's inherit heaven. Teaching that Non Rc's do not have the fullness of the gospel by not being RC therefore are excluded from heaven. Your rants are without merit. If you provided solid data from ancient MSS, your opinions would not be so laughable. But seeing that you are unwilling to study early Christian history, yet claim you are a Christian, your only knowledge about Christianity is what Luther fed you - a Bible only belief which is unscriptural - and what Calvin taught, that his OSAS doctrine provides eternal security. It says IT IS A SMALL RELIGIOUS GROUP THAT IS NOT PART OF A LARGER AND MORE ACCEPTED RELIGION and that has beliefs regarded by many people as extreme or dangerous. That definition is more suitable to your fundamentalist cult which split from mainline Protestantism and accepts many new doctrines that were unheard of in Luther's time. You call yourself Protestant which means protest - so what are you protesting when you have no clue what the Catholic Church's origins are and what she teaches? It is obvious your protests are only against GOD'S COMMANDMENTS WHICH ARE SUMMARIZED IN TWO GREAT LAWS - LOVE HIM AND LOVE NEIGHBOR both of which you fail to do. Study the history of Protestantism, a religion which spawned more cults that any other Christian religion in history. One of the fastest growing is the Mormon Church that accepts many of Luther's teachings including the one that Christ was an adulterer with three wives. Smith got that from Luther who believed that Christ was a polygamist with three wives. Maybe you should call the Mormons your brethren instead of excluding them from your fold. They are nicer folks to share a cuppa coffee with, than you and your curses. Sort out all that in your mind before trying to feed me your version of the Gospel when you don't have a clue. The RC institution teaches a INTERMEDIATE place called PURGATORY a place of extreme heat where those whose sins have not been cleansed by Jesus will be burnt up therefore allowing God to accept only RC's into heaven. This is not taught in scripture and was developed by the RC institution at the council of Trent a purely RC conclave 1500 years after the Ascension of Christ. Any RC who reads this posting has no excuse for claiming they did not know this and who does not search this statement as to its validity must consider themselves accursed also. All are urged to seriously consider whether they wish to remain in an institution that denies the Word of God replacing it with its own doctrine and changing the Word of God into a lie. Purgatory is but one of many false teachings proclaimed by the RC institution. THOU HATH NO EXCUSE OH MAN. LIVE OR DIE IT IS YOUR CHOICE. COME OUT OF IT WHILE YOU STILL HAVE A CHANCE SAYETH THE SCRIPTURES. WHAT HAS RIGHTEOUSNESS TO DO WITH UNRIGHTEOUSNESS. THE RC INSTITUTION IS AKIN TO MORMONISM WHICH USE THE NAME OF JESUS BUT SUBSTITUTE HIS TEACHINGS WITH THEIR OWN. The RC institution teaches a INTERMEDIATE place called PURGATORY a place of extreme heat where those whose sins have not been cleansed by Jesus will be burnt up therefore allowing God to accept only RC's into heaven. Purgatory is but one of many false teachings proclaimed by the RC institution. THOU HATH NO EXCUSE OH MAN. LIVE OR DIE IT IS YOUR CHOICE. COME OUT OF IT WHILE YOU STILL HAVE A CHANCE SAYETH THE SCRIPTURES. WHAT HAS RIGHTEOUSNESS TO DO WITH UNRIGHTEOUSNESS. UNEDITED GARBAGE - LEARN HOW TO CLEAN UP YOUR CLIP & PASTE OPINIONS FROM YOUR MODERN, ANTI-CATHOLIC WRITERS BEFORE HITTING POST - THAT IS IF YOU WANT TO SOUND EDUCATED!! You are way off base denying the apostolic origin of the Purgatory doctrine. Fortunately for Catholics, we are told not to follow every wind of doctrine, but to OBEY HIS CHURCH - THE PILLAR AND GROUND OF TRUTH! Even though you believe you can feed me spiritual teachings, you are a miserable, quivering fundamentalist, lacking honesty, Christian virtue, integrity and IRREFUTABLE FACTS. Your balderdash is unacceptable as God's Word. You keep posting the same garbage over and over and over again without any solid grounds for your false accusations. No one asked you to accept any Catholic claims. It is you who has revealed your troubled soul, inability to find God within, and to hear His voice. "If you love Me, keep My commandments." You chose to reject His commandments and find yourself at sea when YOUR NOVEL BELIEFS ARE CHALLENGED. Your duty is obedience to the Heavenly Father first, not to your reformers and their pudding and pie which you eagerly lap up. Purgatory is a doctrine of apostolic origin. IT WAS TAUGHT BY THE CHURCH LONG BEFORE THE BIBLE WAS COMPILED - see Posts #602 - #604. THE INTERMEDIATE STATE BETWEEN HEAVEN AND HELL WAS EVEN MENTIONED IN JUDAIC TEACHINGS. It is God's merciful love offering a last chance to those who died without full repentance of the sins of omission and commission. Once the soul has fully expiated the slightest stain of sin, only then will that soul be allowed in Heaven. Jesus was emphatic about this point. Luther even believed in the doctrine of Purgatory. His newer cults and sects eschewed the doctrine in favor of his easy grace religion and Calvin's OSAS. St. John Eudes Was A Catholic Saint, a Parish Missionary Priest, A Religious Founder of Two Congregations, And A Tireless Apostle Of Devotion To The Sacred Hearts of Jesus and Mary. He lived in France in the 17th century, a century marked by opposing religious phenomena and also by great political problems. It was the time of the Thirty Year War, which devastated not only a great part of Central Europe, but also many souls. How little we know where God’s grace will lead. 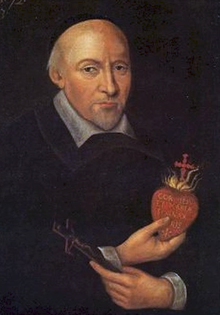 St. John Eudes was the oldest child of five boys and two girls born on November 14th, 1601, to Isaac and Martha Eudes. Isaac was the sole survivor of a family wiped out by the plague. He was not able to realize his dream of becoming a Priest. Instead he became a surgeon in Normandy in the little village of Ri in northern France. He cultivated the soil and recited his breviary every day. Two of his children became famous in different ways. Francis Eudes de Nézeray was a French historian who wrote the monumental “History of France.” John attended the Jesuit College at Caen, France at age 14, took a vow of chastity and tried to live in imitation of the Lord Jesus. After college, he joined the religious community of the Oratorians. Immediately after his ordination at the age of 24, he came down with an illness that kept him bedridden for a year. During severe plagues in 1627 and 1631, he volunteered to care for the stricken in his own diocese at great risk to his life. He went about Normandy committing himself to the sick, administering the Sacraments, and burying the dead. When he was 32, John became a parish missionary. He was very popular and known as the greatest preacher of his age, preaching over 100 parish missions all over France, especially throughout Normandy. Some lasted from several weeks to several months. He is probably best known for the central themes of his writings: Jesus as the source of holiness, Mary as the model of the Christian life. In his parish mission work, John was disturbed by the sad condition of prostitutes who sought to escape their miserable life. Temporary shelters were found but arrangements were not satisfactory. In 1641, he recalled these women from their sinful lives and, aided by the congregation he founded called the Sisters of Charity, he was able to provide shelter for these reformed women. St. John recognized the pressing need for contributing to a reform of the clergy. To this end, he felt it was imperative to establish a seminary at Caen. Reluctantly, he left the Oratory to accomplish this purpose. On March 25, 1643, with a few other Priests, he founded a congregation dedicated to the spiritual and doctrinal formation of Priests. Other seminaries were soon added to the one at Caen. Thus, the Congregation of Jesus and Mary was born for the education of Priests and missionary work. St. John also worked against Jansenism. During that time, he assimilated the Christocentric spiritual thought of de Bérulle and shared his enthusiasm for "restoring the priestly order to its full splendor". While contempt was being spread for the Christian faith by some currents of thought that were prevalent then, the Holy Spirit inspired a fervent spiritual renewal, with prominent holy personalities such as that of Berulle, St. Vincent de Paul, St. Louis Mary Grignion de Montfort, St. John Eudes, St. Jane Frances de Chantal and Saint Francis de Sales. This great "French school" of holiness also had St. John Mary Vianney among its fruits. St. John died at Caen, on August 19th, 1680. His virtues were declared heroic by Leo XIII, on January 6th, 1903. The first-class miracles proposed for his beatification were approved by Pius X, May 3rd, 1908, and he was beatified April 25th, 1909. By a mysterious design of Providence, Pope Pius XI, proclaimed John Eudes and the Curé d'Ars Saints on the same day, May 31, 1925, thus offering the Catholic Church and the whole world two of the most extraordinary examples of priestly holiness at that time. Hippolytus of Rome (170–235) was the most important 3rd-century theologian and Priest in the Catholic Church in Rome, where he was probably born. Photios I of Constantinople describes Hippolytus in his Bibliotheca (cod. 121) as a disciple of Irenaeus, who was said to be a disciple of Polycarp. The Catholic Church definitely has a sense of humor. We see this in her decision to compel St. Pontian and St. Hippolytus to share a common feast day, August 13. During his time on earth, St. Hippolytus was a controversial figure who censured four Popes. He despised poor St. Pontian, who was the Pope from 230 to 235. Actually, St. Hippolytus bitterly opposed St. Pontian's three immediate predecessors: Zephyrinus, Callistus, and Urban. Why? Because in the view of St. Hippolytus, these men had softened the penitential system to accommodate the large number of new pagan converts. He also found them too lenient toward Christians who had defected from the Church during times of persecution. Such public sinners, St. Hippolytus asserted, should never be readmitted to the Church. He wanted permanent excommunication. All of the Popes, however, acted with mercy, welcoming back the former apostates. St. Hippolytus had a brilliant response to the lenient Popes: In 217, he rebelled against the Church when Callistus became Pope. He declared that the four Popes were truly heretical, and proclaimed himself the only true Pope. As such, St. Hippolytus is usually regarded as the first Anti-Pope. Others would surely follow. The shockingly inflammatory attacks of St. Hippolytus against four legitimate Popes of the 3rd century remind us of a debilitating trend within Catholicism: The worst attacks on Church leaders, especially the Popes, come from inside the Church, not from external forces. Today, for example, one hears some ultra conservative Catholics whispering that Pope Francis is a communist, Mason, Protestant, Muslim, and so forth. And the archives of some Bishops and Pastors are heavy with poisonous letters, most of which come from the hands of the devout. Rarely does any Bishop or Pastor receive fiery criticism from, say, the local fundamentalist preacher, atheist, or ACLU chapter. For sure, the Church has many external enemies; but the "insiders" do the most damage. of imprisonment and hard labor, which St. Hippolytus had never endured, softened his heart and led him to reconsider his harsh view of sinners and the four Popes whom he had frequently denounced. In any event, St. Hippolytus was finally reconciled with the Catholic Church. His writings were important, including A Refutation of All Heresies, Song of Songs, and The Apostolic Tradition. He was slain in Sardinia where he had been exiled along with Concordia and other companions. In 236 AD, the bodies of St. Hippolytus and St. Pontian were brought to Rome where Pope St. Fabian acknowledged both as Catholic martyrs. The reigning "lax" Pope graciously set aside the destructive behavior of St. Hippolytus, thereby demonstrating by deed the orthodox truth about forgiveness. We can learn several lessons from the story of St. Hippolytus and St. Pontian. First, divisions within the Church, whether over small or great matters, weaken her witness, thereby inviting persecution from outside. When the enemies of the Church notice that Catholics do not be have charity toward one another, they assume that many don't really love one another and therefore the Church will easily collapse. Second, persecution from outside inevitably strengthens the Church by forcing believers to acknowledge their faith, to examine their own behavior within the Church, and to repent. Would St. Hippolytus have reconciled with St. Pontian without spending time in the salt mines? Did Emperor Maximin know he was making a Saint from a bitter man? Who knows? Indeed, God's ways are always very mysterious. He can make Saints out of bitter men after testing them with tribulations! firebird! Glad you started another thread. I don't learn a lot of NEW and interesting stuff here - other than Terry's research and your articles on saints. The part about the sense of humor gave me a smile! St. John recognized the pressing need for contributing to a reform of the clergy. To this end, he felt it was imperative to establish a seminary at Caen. Reluctantly, he left the Oratory to accomplish this purpose. Looks like the RC institution need another one like your John. St. John recognized the pressing need for contributing to a reform of the clergy. To this end, he felt it was imperative to establish a seminary at Caen. Reluctantly, he left the Oratory to accomplish this purpose. Looks like the RC institution need another one like your John. It looks like the Protestant religion and its 45,000+ divisions are in sore need of another like our St. John. There doesn't appear to be any reform of your ministers. Just recently, Terry posted on your Vicky Gene Robinson, an admitted homosexual partnered bishop. Why is that you were silent about him in the seven years you have been on the forum? Consider the many times I posted that God always reforms the Church when some go astray. God does this by giving us great Saints to keep us sinners on track! That is because He has promised His divine guidance and protection of His Church until the end of time. Did you conveniently forget that? Or is it that you don't trust God to keep His promises? I do. It is evident that He has kept His promise for over 2,000 years to protect his Church. Every heresy that arose in the early centuries soon fizzled out and is now surfacing in YOUR RELIGION - under the guise of a purported true church with watered-down doctrines. Another day, another division - latest count, approx. 45,000+ Protestant churches. Start looking within, and asking God to keep you on track with His teachings, since you veered too far away from the apostolic deposit of faith. Then you won't need to meddle in Catholic Church matters when you are willfully ignorant about our 2,000 year old beliefs. You need to have a closer walk with God instead of rejecting His Ten Commandments which is the cause of your soul disturbance, habitual lying and persecution of believers. You gave me the impetus for starting another thread. It was quite frustrating, just as it was for you to try and open up the old thread. IMB that it was the volume of content and replies that got too big for the data to be processed. It is not surprising that you don't learn a lot of NEW and interesting stuff in the Religion Corner. The ones trying to steer the convos. away from historical and biblical study are hoping to drown out our voices. But hey, when people are unhappy with themselves, they will create mischief, disrupt the teachings and keep trolling. You gave me the impetus for starting another thread. It was just as frustrating for me as for you to wait a while before the thread opened up. It is not surprising that you don't learn a lot of NEW and interesting stuff here. The ones trying to steer the convos. to just personal opinions without any research are trying to control what each of us says. But hey, when people are unhappy with themselves, they will resort to mischief and slamming, yet are unable to hold anyone's interest! my bet is it was just as frustrating for daj, as he was eager to jump on the new thread and start trashing it .. I never had a problem opening the old one. Get a Mac Cheriq. In the late 80s, I learned on Apple 2C and 2E. Then they invented Macs with icons and a mouse. I learned that. Then, I changed schools and had to learn the PC languages from 3x on up. I first bought a Mac for home. Then, I got a PC. I was frustrated at my lack of control over the inner-workings of the Apple family. I've had an Apple phone, as well as an Android system, and Windows system. I hated the Iphone 5 (Apple product). It is the latest and greatest and it is in a drawer. No. Won't be buying an Apple product having tried several to compare. neither did I with a Toshiba notebook or my Dell, with Windows 7 and XP respectively ..
the majority by far of website contricts and applications interface better with windows ..
don't need spell check and you know it ..
you private messaged me two times .. so WHY ACT DUMB ??? then why are you still misspelling words? To proud to admit you make mistakes? and your sentence structure for a man who went to two seminaries and university is something else. That is why I said I was having trouble reading your posts. Look at the last one you posted #17. If you are physically or mentally challenged then I apologize for my comments.